So I recently saw an article on Galleycat that solves the publishing crisis in such a simplistic and obvious way that I can only call it genius. Anyone outside the industry may not realize this, but books aren’t doing so hot right now. The industry is sort of facing what the music industry did during that whole Napster thing. (The Internet? What is that? Someone call Metallica!) And while they were trying to figure out how make money off this wacky e-book thing while not killing brick and mortar bookstores with complicated lawsuits and authors guild disputes, one independent publisher found a solution that only required a few lines of text. You see, for as many books as there are on bookshelves, there are millions sitting on the hard drives of laptops across America. Turns out most people really do think they have a book in them. And each of those writers fire off letters to agents and independent publishers daily (only indie publishers will accept unagented material). Imagine the amount of manuscripts these publishers receive on a regular basis, it’s enough paper to make an environmentalist find a steep cliff. And one such indie publisher decided to use those wannabe writers to pump air into the life support of your local bookstore. Tin House Books is offering, for a limited time, to accept unsolicited (ie. unagented) manuscripts if, and only if, the writer mails the manuscript with a receipt proving he/she has purchased a book at a bookstore recently. Think about that: they will read your book if you prove that you read books yourself. “Writers who cannot afford to buy a book or cannot get to an actual bookstore are encouraged to explain why in haiku or one sentence (100 words or fewer). 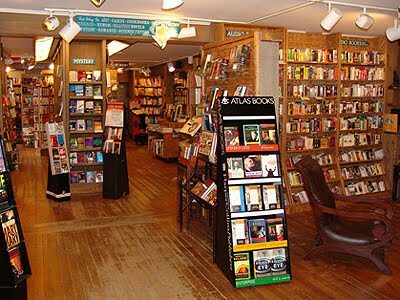 Tin House Books and Tin House magazine will consider the purchase of e-books as a substitute only if the writer explains: why he or she cannot go to his or her neighborhood bookstore, why he or she prefers digital reads, what device, and why. I think if every struggling writer out there supported another writer by buying a book, the industry would look like the Silicon Valley in the late ‘90s because that’s how many unpublished authors are out there. And one day, if/when each of these writers makes the leap to published author, he/she is going to hope a future struggling writer returns the favor. (BTW: the last book I purchased at a bookstore was a Sneezy Louise children’s book by Irene Breznak).